There is no lack of things to do in Cape Cod Massachusetts. Whether you are looking for something free to do, a family friendly activity, or a romantic getaway, you can find it at Cape Cod. 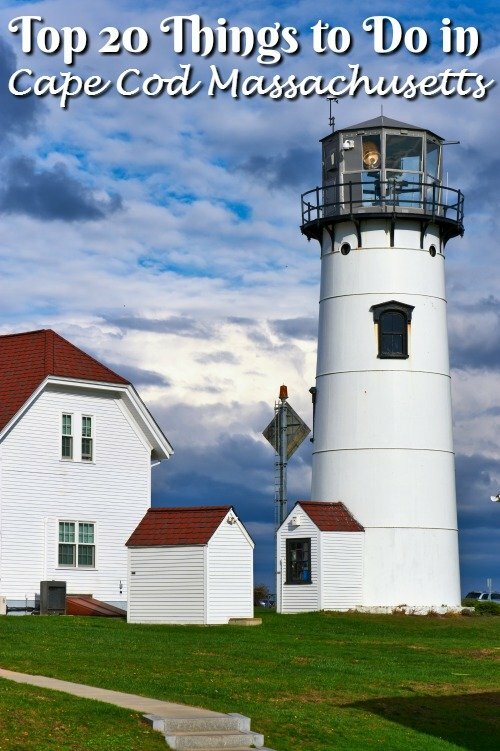 Here are the top 20 things to do in Cape Cod Massachusetts! Take a free walk along the Cape Cod Rail Trail. Perfect for couples, families, and relaxation. Plus you can’t beat the views. Visit the seashore. In 1961, the east shore of Cape Cod was made into Cape Cod National Seashore and is recognized as a National Park. You kids can take in the Junior Ranger program, it’s a great roadschool lesson. Catch a show at the oldest professional theater the Cape Playhouse. This theater has had everyone from Henery Bogart and Betty White. Catch a movie at the Wellfleet Drive-In. You can’t beat an old drive-in movie. With a playground in front of the screen, this is the perfect theater for families and a family night out. Sandwich’s Heritage Museums and Gardens has over 100 acres of gardens and a rich history of American folk art and automobiles. This is the largest southern New England garden and worth a stop. The Pilgrim Monument is a sight to behold and one worth a thousand words in a picture. This monument also has an attached museum. The museum not only has info on the pilgrims but also on the Native Americans from the area. Edward Gorey fans will love the rich history of the Edward Gorey House. No idea who Edward Gorey is? He was an animal enthusiast extraordinaire, artist and author. Take in some history and learn more! Woods Hole Science Aquarium is home to 140 different species of marine animals found in Northeast and Middle Atlantic waters. Plus admission is free! Find spectacular art at the Eastham Painter’s Guild’s Outdoor Fine Arts Gallery. Many art shows and even classes to check out. Take stunning pictures at the top of Marconi Station. Another National Park site where your kids can get a Junior Ranger Badge nad take in the great views. Enjoy a sunny day at the Nauset Beach where you have 10-miles of sandy beach to stroll. Come on you came to Cape Cod for the beaches anyway right? Take a romantic walk through the wooded canopies of the Atlantic White Cedar Swamp Trail. Snap a picture of the seals and whales at Race Point. This is one of the more popular lighthouses in Cape Cod, it was the 3rd lighthouse in the cape. It is now on the National Register of Historic Places. Go wine tasting at Cape Cod Winery in East Falmouth. We love taking in local wines. Have a real pirate adventure at the Whydah Pirate Museum. This museum is interactive and tells the history of pirates in the area. Take a relaxing cruise on the Island Queen to Martha’s Vineyards. See the cape from the water! Go on a zip lining adventure at Heritage Adventure Park. This has become a big sport and it’s really fun to do! Take a guided tour through the waterways of Cape Cod at Cape Kayaking. Exercise and sightseeing tour all in one. Give your kids a day of fun at the Cape Cod Inflatable Park where they can enjoy both wet and dry rides. Slide out of a dinosaur mouth or rock climb. You can also try your hand at trap ease or tightrope walking. Walk the Cape Cod Canal. What the sun set over the canal and taking on the sights. From historic monuments and museums to relaxing fun and adventure, there is a lot to do on Cape Cod. What do you like to do in Cape Cod Massachusetts? We would love for you to share things you like to do on Cape Cod in the comments below!